You can send a test version of your marketing email to yourself or a team member before you send out the actual email to your contacts. Please note: if you have a Marketing Hub Starter account, learn how to send a test email in the drag and drop email editor. Hover over the name of a draft email and click Edit. In the left sidebar, click the mail icon email . Click the Choose one or more recipients dropdown menu and select the email address(es) to send the test email to. Click the Receive email as a specific contact dropdown menu if you want to test any personalization tokens used in the email, or leave it blank to preview sending the email to an unspecified contact. 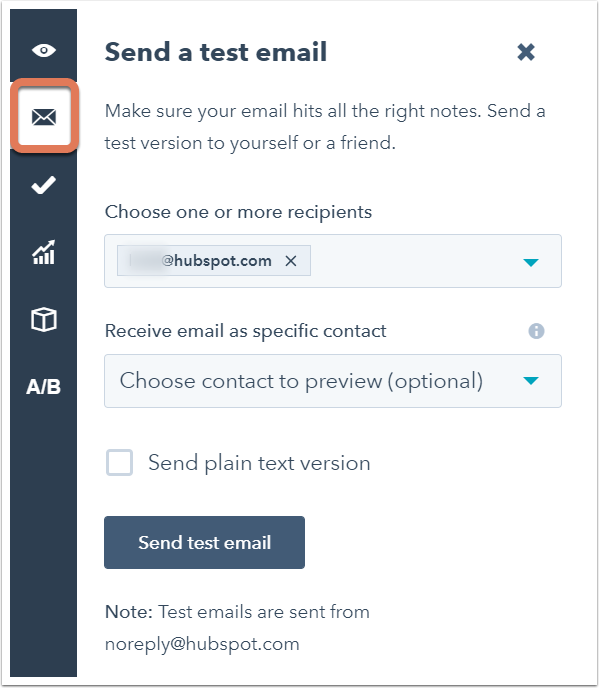 Why are test emails sent from noreply@hubspot.com? All test emails are sent from noreply@hubspot.com, to protect your email deliverability rates. When you send the email to your contacts, it will be sent with the From name and From address you've specified.